There’s a symphony playing in the Plasma Mass Spectometry Facility at Woods Hole Oceanographic Institution (WHOI). Tired but attentive, oceanographers attune their ears to the subtle hiss of inert gases moving through the plumbing, the percussive beat of printers churning out new numbers, and, at front and center, the whine of mass spectrometers measuring streams of atomic ions. After enough time, they can discern shrill from dull, repetitive from intermittent, rapid from slow, and hear patterns in the noise. For researchers like me, using the Inductively Coupled Plasma Mass Spectrometer, or ICPMS, is a rite of passage. It’s an intermediary zone between the gritty realities of field work, where we collect samples that go into the ICPMS, and the rarefied realms of new insights, which emerge from the torrent of data that comes out of the ICPMS. It’s also a fascinating rite of passage for the samples themselves, which undergo a brief (about six minutes) but transformative journey inside. Let me give you a tour—from the perspectives of both scientists and molecules. A few years ago, I was invited to participate in an expedition aboard the research vessel Roger Revelle to the Southern Ocean, where WHOI marine chemist Phoebe Lam and colleagues were investigating a phenomenon known as the Great Calcite Belt. It appears in satellite images as a vast milky-white band in the ocean encircling Antarctica. Its color comes from the rich concentrations of the mineral calcite in the waters near the surface. Scientists hypothesize that these high calcite concentrations are produced by massive blooms of algae spanning the Southern Ocean. These algae are called coccolithophores, each one just a thousandth of an inch in diameter. Under the microscope, they appear as spheres covered in plates of the mineral calcite. Like all algae, coccolithophores are photosynthetic: They use solar energy to make their own food by transforming carbon dioxide (CO2) in seawater into complex organic molecules: amino acids, sugars, etc. When they bloom in the austral spring, coccolithophores create the oceanic equivalent of the Great Plains or the Serengeti, providing sustenance for the greater marine food web. Coccolithophores become part of the marine food web, and when they are eaten, digested, and expelled, some fraction of the organic material they originally produced decomposes back into CO2. But the rest remains intact in particles that sink into the deep sea. Sinking organic carbon plays a critical role in determining Earth’s global climate. CO2 is a heat-trapping greenhouse gas. 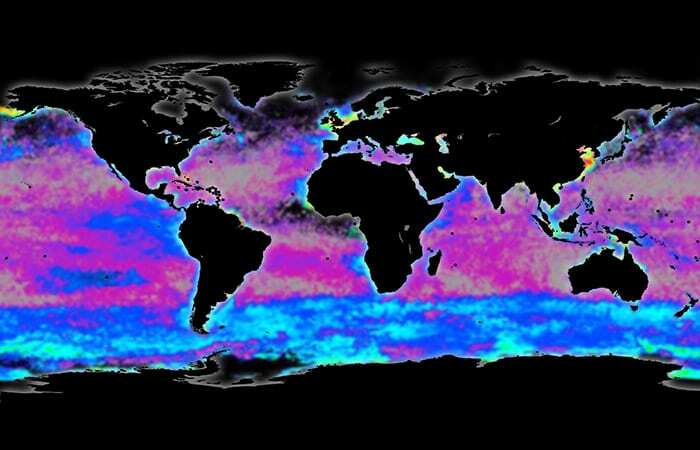 The deeper organic carbon sinks into the ocean, the farther it is from the surface ocean and atmosphere. If the carbon settles in sediments on the seafloor, it can be sequestered from the atmosphere for millions of years. Even if it eventually is converted back to CO2, it is CO2 that is 3,000 feet below the surface, which takes much longer to rise back to the surface than CO2 only 30 feet deep. Lam’s research group at WHOI, along with collaborators in oceanographic institutions in Maine, Bermuda, and the United Kingdom, have wondered about how tiny coccolithphores in regions like the Great Calcite Belt fit into the big picture—the planetary carbon cycle that, in turn, regulates Earth’s climate. 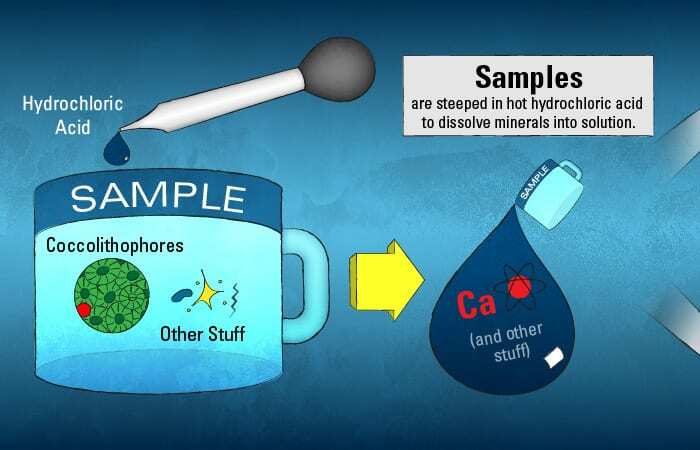 They wanted to test the hypothesis that the relatively heavy calcite plates from algal detritus may stick to organic carbon, dragging it more quickly and efficiently down into the deep sea. These Great Calcite Belt scientists aimed to follow the path of organic carbon coming from these unique algal communities. To start, they visited the Southern Ocean during the austral summer (our Northern Hemisphere winter)—the warmest, calmest, and safest time to visit the most turbulent region of the world’s oceans. During ten weeks at sea, we rode through 20-foot swells, skirted around several icebergs, and worked through a few storm systems. We sailed from Chile eastward to Australia, down and back up several times through the Great Calcite Belt, gathering samples from the Atlantic and Indian Ocean sections of the Southern Ocean. At the end of two 35-day expeditions across the Southern Ocean, Lam and colleagues had collected water samples filled with particles of organic carbon and calcite from 27 different locations in and out of the Great Calcite Belt. Once these samples arrived in Woods Hole, it was my time to make the next rite of passage through the ICPMS facility. The Plasma Facility can seem like another world—oceans away from the ocean itself. Your first sensation upon entering is the cold. To function reliably, the instruments in the Plasma Facility need to be maintained at low and relatively constant temperatures. Changing temperature and humidity can slightly shift the pressure of gas flowing through the instruments, or the diameter of apertures, affecting the way the ICPMS makes its measurements. So even on the hottest summer days of Cape Cod, a scientist would be wise to think back to days on the Southern Ocean and bring a winter coat to work. The next, perhaps more overwhelming, sensation is the chaotic sights and sounds from the intricate mechanisms inside each mass spectrometer and its appendages. The deliberate maze of wiring allows scientists to tune the ICPMS to make the precise measurements they seek to answer their particular scientific questions. In this case, the question is, do coccolithophores’ calcite plates abet the sinking of organic carbon into the depths? To answer this question, an essential first step was to measure exactly how much calcite was in the seawater samples collected at each of the 27 locations in the Southern Ocean. So the ICPMS was tuned to detect and measure elemental calcium (Ca), a building block of calcite (CaCO3). Our arduous voyage through the Southern Ocean was nothing compared with the extreme high-speed, ultrahot journey that those calcium atoms would take through the ICPMS to become valuable numbers on a computer monitor. Of course, it is not as simple as injecting particle-filled seawater samples into the ICPMS. Solid material would clog it. Instead, the calcite mineral in these particles needs to be dissolved into a solution. Almost as in making tea, the samples are steeped—not in hot water, but in hot hydrochloric acid—for roughly 12 hours. After the “tea” cools, any remaining solids are removed, leaving behind just the dissolved constituents, including calcium, ready for injection into the ICPMS. 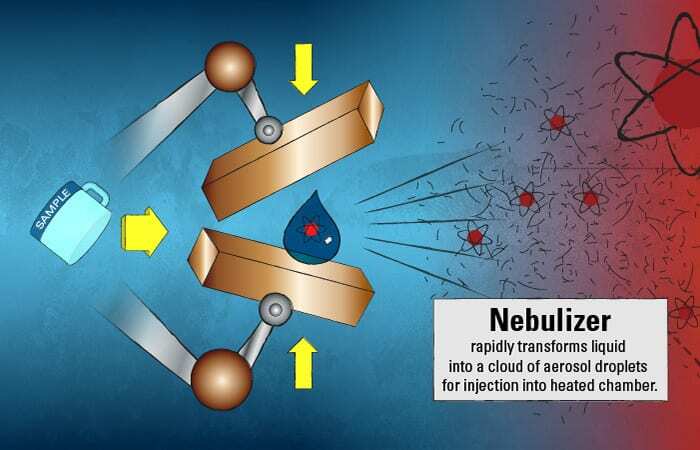 This marine particle “tea” is injected into the ICPMS and immediately hits a nebulizer, which, similar to a paint sprayer, rapidly transforms the liquid into a cloud of aerosol droplets. These small droplets then enter a chamber heated to 6,000° Kelvin, or about 10,340° F—the surface temperature of the sun. The chamber is filled with argon, a relatively inert element. 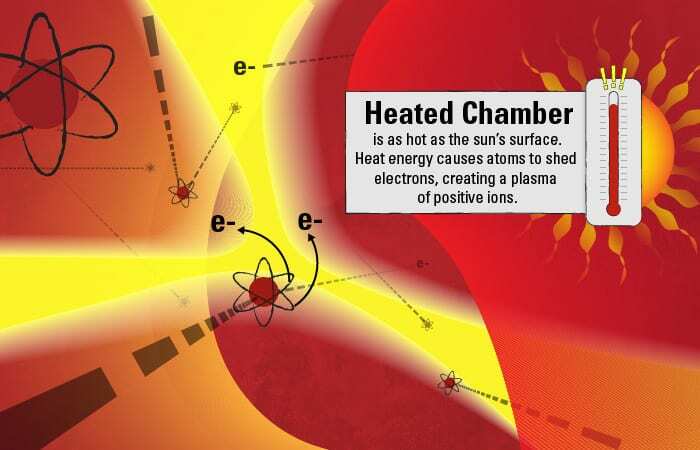 But the intense heat supplies so much energy that some of the negatively charged electrons surrounding the argon atoms gain enough energy to overcome the inward pull of the positively charged protons in the atoms’ nuclei. The electrons depart their orbits, leaving behind a plasma of positively charged ions. If there is enough heat to turn argon atoms into an ionic plasma, less stable elements in the aerosol droplets should meet a similar fate. Such is the destiny of the dissolved calcium atoms in the droplets: The heat supplies energy that causes them to shed electrons and become positively charged ions. 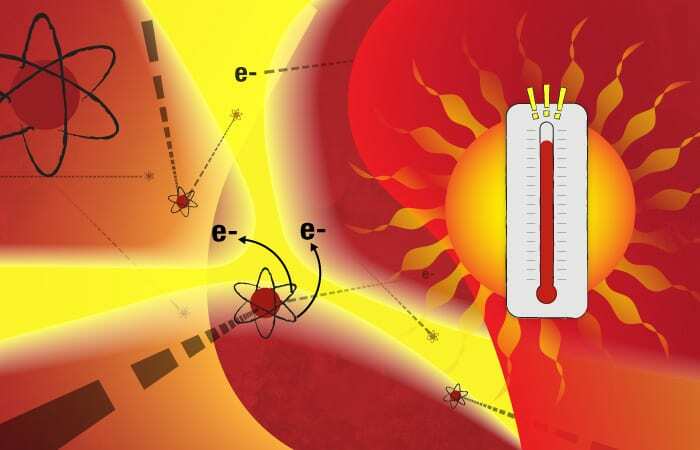 In the dynamic plasma, fast-moving electrons and ions also collide with one another, also supplying energy to create a cascade of additional ions. This pool of diverse ions from various elements in the original samples speeds along toward the next phase of the journey inside the mass spectrometer. The ions enter a vacuum in a curved tunnel bounded by magnets. Each type of ion in the mix has its individual mass and charge, and based on these properties, the magnetic force will cause the ions to bend toward their own unique trajectory. The calcium ions trace their species’ own unique path. 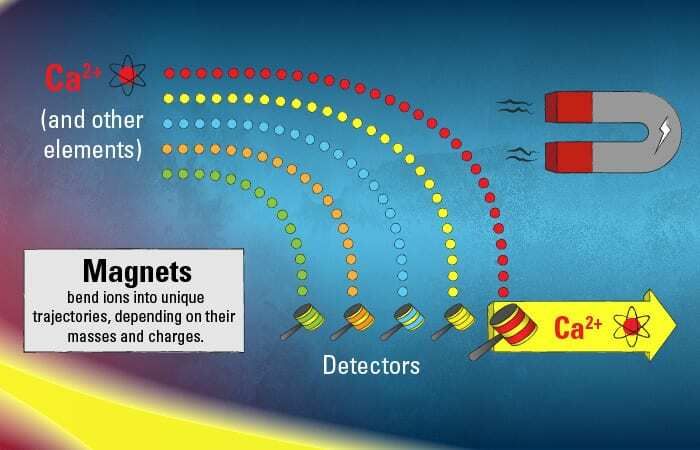 Their journey ends when they hit detectors—in a target region that that only ions of their particular mass and charge should be able to hit. 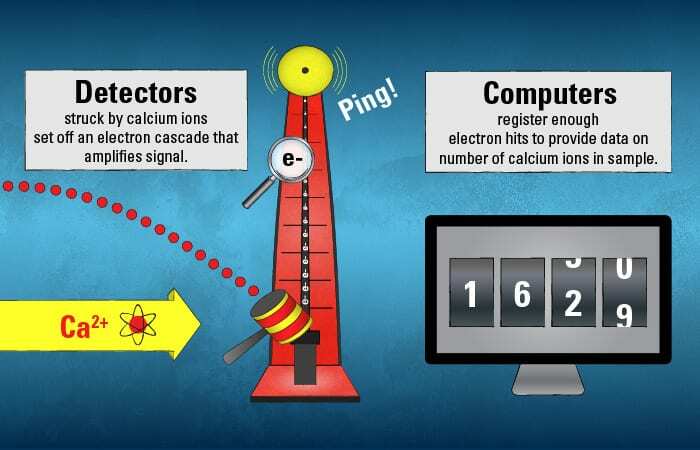 The calcium ions’ initial collision with the detector sets off a cascade of electrons at secondary detectors that amplify the signal, accumulating enough electron hits to be registered as a count by a scientist waiting at the computer monitor. After all the samples made their way through the ICPMS, we could re-emerge in the quieter, warmer halls of the Clark Laboratory building knowing how much calcite was in our Southern Ocean particles. The ICPMS’s measurements brought us closer to answering the initial questions that took us to the Great Calcite Belt in the first place. Thus far, the ICPMS has affirmed to Lam and colleagues that coccolithophores do play a role in delivering organic carbon produced at the surface to the deeper parts of the Southern Ocean. But, like many scientific stories, this one is more complicated than originally suspected. The role of these algae and their calcite shells is not quite straightforward. The research has expanded lines of inquiry, which will likely lead through other mass spectrometers, playing new symphonies. This research was funded by the National Science Foundation and the National Aeronautics and Space Administration. 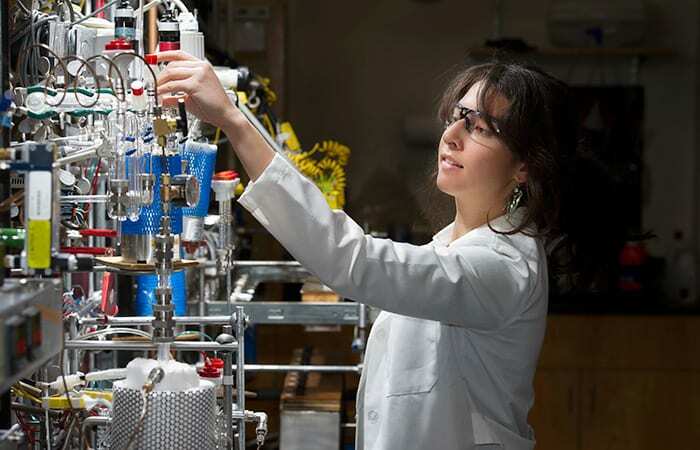 Sarah Rosengard is supported by an NSF Graduate Research Fellowship.